The attorneys and staff at LoCoco, Lococo & Gatewood, PLLC, are committed to helping our clients achieve the results they want. We are also committed to treating people with respect and compassion along the way. Financial recovery is very important for our clients, and so is having a lawyer they can trust. We earn our clients’ trust every day by listening carefully to their needs. Every client and every case are unique; what works for one may not be right for another. That is why our attorneys tailor distinct solutions that meet each client’s individual needs. This approach creates good client relationships and helps us recover the settlements and verdicts clients want. The firm’s reputation as a tough opponent is well deserved. While our attorneys understand the value of negotiation, we are also skilled litigators who will aggressively pursue your case in court when necessary. We have won millions of dollars against powerful companies, international employers and the federal government. The majority of our practice is dedicated to personal injury claims, including auto accidents, wrongful death and defective products. We also fight for the rights of injured seamen and longshore workers. Our attorneys can help you obtain Social Security Disability Insurance and Supplemental Security Income, as well. 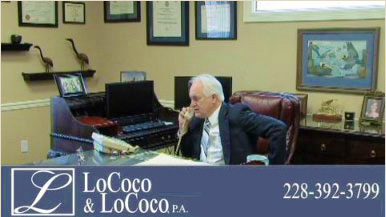 For a free consultation with our attorneys, please call 228-392-3799 or contact us online. Personal injury cases are taken on a contingency-fee basis. If we accept your case, there is no fee unless we recover damages for you.